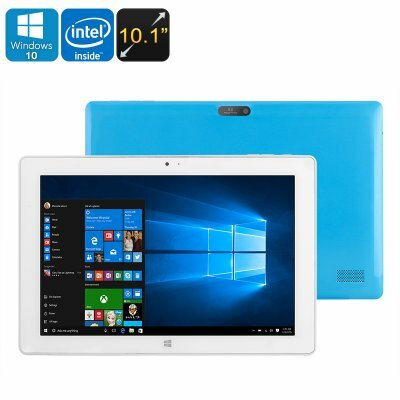 Successfully Added Windows Tablet PC - Windows 10, Intel Cherry Trail CPU, 1.66GHz, 2GB RAM, 10.1 Inch FHD Display, 6000mAh, OTG to your Shopping Cart. This cheap Windows 10 Tablet PC is a great electronic gadget for all of you that wish to watch movies and play mobile games on the go. On its beautiful 10.1-Inch display, this Windows tablet computer portraits all your favorite media in stunning Full-HD resolution thanks to which it truly provides you with a cinematic experience at any given moment. The latest IPS technology further enhances your visual experience by delivering vivid color and crisp detail, letting you enjoy your favorite media like never before. Play games, watch movies, and browse the web – nothing is too much for this beautiful Windows tablet PC. Packing some serious hardware, this powerful cheap Windows tablet PC allows you to take the absolute most out of all its Windows features. The Intel cherry Trail Z3736 processor that has been clocked at 1.66GHz delivers all the power needed for you to enjoy a fast and smooth user experience. Along with the tablet’s 2GB of RAM, it is capable of handling your toughest of demands without ever slowing down the device. Coming with 32GB of internal storage as well as the possibility to insert 64GB of external data, this Windows tablet PC brings along plenty of memory for you to save all your files and media alike. Thanks to its Windows 10 operating system a smooth user experience is guaranteed. Whether you use it for business or entertainment, this cheap Windows tablet PC has an answer to all your demands. Packing a powerful 6000mAh battery, it takes you through countless hours of usage time – taking away all your fears of running out of juice in the middle of the day. Play games, watch movies, make notes, or browse the web – this powerful Windows 10 tablet computer is a top electronic gadget for students, business people, and everybody that likes to enjoy media while on the go. This Windows 10 Tablet PC comes with a 12 months warranty, brought to you by the leader in electronic devices as well as wholesale electronic gadgets..
Windows OS is pre-installed English, and other languages need to be downloaded by WiFi. Arabic: - الروبوت اللوحي - Chinese Simplified: - 安卓平板电脑 - Czech: - Android Tablet PC - Danish: - Android Tablet PC - Dutch: - Android Tablet PC - French: - Android Tablet PC - German: - Android Tablet-PC - Hebrew: - אנדרואיד Tablet PC - Hindi: - एंड्रॉयड टैब्लेट PC - Italian: - Android Tablet PC - Japanese: - アンドロイド タブレット PC - Korean: - 안 드 로이드 태블릿 PC - Malay: - Android Tablet PC - Norwegian Bokmål: - Android tablett PC - Romanian: - Tableta PC - Russian: - Android планшетный ПК - Spanish: - Android Tablet PC - Thai: - แอนดรอยด์แท็บเล็ตพีซี - Turkish: - Android Tablet PC - Vietnamese: - Android Tablet PC.